It’s not surprising that the Freemasons Victoria “call to arms” is Make a Difference – for all the excellent work achieved by the Freemasons Public Charitable Foundation does just that. It’s also most fitting for the MDA to have as its “call to arms” – Making a Difference – because that’s what we predicate all of our actions upon – making a difference to members of the MD community and those people supporting them. So when Deputy Grand Master Vaughan Werner visited the MDA it was with the express purpose of assisting the MDA meet its objectives in conducting respite programs like CampMDA on behalf of the MD community. 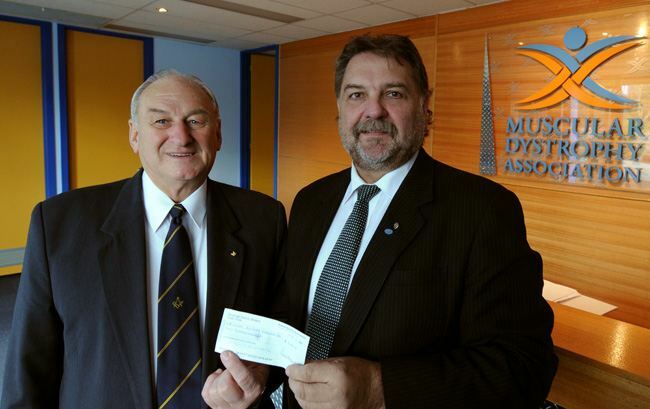 What ensued was a presentation of $5,000 on behalf of the Freemasons Public Charitable Foundation which was accepted on behalf of the MDA by its ED, Boris M Struk. “Thank You” to Freemasons Victoria and the Freemasons Public Charitable Foundation, you have Made a Difference!.